What is #MeetMyImmigrants all about? So, what's #MeetMyImmigrants all about? I started this series to highlight the many immigrant ancestors of mine that left behind everything they knew to forge better lives for their families. I am third-, fourth-, fifth-, and sixth-generation American. Most of my ancestors didn't step foot on American soil until the early 1900s. Given all of the discussion at the moment of who should and shouldn't be allowed to enter the US, I thought it more topical than ever to remember that America is a country mainly made up of descendants of immigrants (in addition to descendants of the Native population, as well as of 450,000 slaves that were brought here against their will in the Middle Passage). A lot of our ancestors wouldn't have made it here if the immigration laws had looked then like they do today. CNN has a great article about the 1917 Immigration Act and its similarities to the recent Executive Order here. I am a student of history, and I think it's important that we remember it and we learn from it. Our ancestors lived in, were affected by, and shaped these times. Who were your immigrant ancestors? I can't wait to meet them. I encourage you to share their stories using the #MeetMyImmigrants hashtag. Alternatively, let's work together to find the stories of your immigrant ancestors. Henriette (née Prilwitz) Schroeder, my 4x-great-grandmother, was born, according to various reports, in September 1817, about 1820, or about 1844 in Germany. Like her husband, she is a bit of a mystery to me. She was also probably from “Hinterpommern.” Henrietta married Frank Schroeder around 1855, and they had several children together. According to the 1900 census, she had six children, all of whom were still alive in 1900. She may have immigrated to the US with several of her children on the S. S. Hermann, which departed from Bremen and arrived into NYC 11 March 1872. [I’m uncertain whether this is the correct Henriette Schroeder or not.] It doesn’t appear she ever became a US citizen. According to the 1900 US census, she was able to speak English. She lived with her daughter at 23 Holden Lane in Jersey City, NJ, at least from 1900 to her death. She died in Jersey City 19 February 1905. She was buried with her husband in Jersey City Cemetery. As I am able to find more information on Henrietta, I will write an update! Who were your immigrants? I encourage you to share their stories using the #MeetMyImmigrants hashtag. I can't wait to meet them! View Henriette's original post on Facebook. Frank (likely Franz) Schroeder, my 4x-great-grandfather, was born approx. August/September 1837. He is a bit of a mystery to me. It seems likely that he was from “Hinterpommern” – an area of Germany that became the Province of Pomerania, and where his daughter claims to have been born. (A son, William, also claimed birth in Prussia in later records.) Frank married Henrietta Prillwitz around 1855, and they had several children together – including Bertha Schroeder. Frank worked as a day laborer, at least upon his arrival into the US. Various records suggest he arrived in 1870 or 1881. It doesn’t appear he ever became a US citizen. According to US censuses, he was able to speak English. He lived with his daughter at 23 Holden Lane in Jersey City, NJ, at least from 1900 to his death. He died from a cerebral hemorrhage in Jersey City 3 March 1911. He was buried with his wife in Jersey City Cemetery. I went and visited their graves a few months ago – there is no gravestone marking their burials. As I am able to find more information on this immigrant, I will write an update! Are you ready to meet your immigrants? Let's work together to find your roots. View Frank's original post on Facebook. Carolina Lemke, my 4x-great-grandmother, was born in Germany, likely Weitenhagen, Prussia. Various records place her birthdate at July 1817 or July 1827. She married Christian Sobke in the 1850s, and had at least five children - Carl, Hermann, Franz, Ernestine, and Gustav. All five immigrated to the US. Carolina immigrated herself with her sons, Hermann and Gustav, on the S. S. Aller, which departed from Bremen. They arrived at New York City 12 May 1888. She lived on Grand Street in Hoboken with her daughter, Ernestine, and Ernestine's family. Carolina died from bronchitis in Hoboken 3 August 1905. She was buried in Bay View Cemetery in Jersey City, which I have visited. She was buried alone, and no stone exists for her, but the photo is of the area in which she was buried. View Carolina's original post on Facebook. Maria Fortunata Mari, one of my 31 foreign-born 3x-great-grandparents, was born 14 September 1833 in Baronissi, Salerno, Italy. She worked as a farmer, and married Angelandrea Napoli in Baronssi 3 April 1859. Andrea worked as a farmhand, and they had at least six children together, including Raffaela, my 2x-great-grandmother (#MeetMyImmigrants, Day 4). Andrea died before 1905, and Fortunata immigrated to the US on the S. S. Francesca, which arrived at New York City 18 September 1905. Fortunata traveled with her daughter, Vincenza, and several of her grandchildren. She was briefly detained for special inquiry at Ellis Island (apparently she showed signs of senility), but she had a doctor's certificate which allowed her entry. She lived with her daughter and son-in-law in New York City in Italian East Harlem. She died 4 July 1914 in New York City from a cerebral hemorrhage. She was buried in Calvary Cemetery - the largest cemetery in the country. View Fortunata's original post on Facebook. Ann Hobson, one of my 31 foreign-born 3x-great-grandparents, was born in 1841 in Hanley, Staffordshire, England. Her family moved to Stoke Upon Trent about 1846, and Penkhull between 1851 and 1861. Before her marriage, she worked as a dressmaker. Her father was a plumber and a glazier, and he likely worked at the Potteries with John Foulkes, his eventual son-in-law. Ann married John in 1861, and immigrated with her husband and children in the 1870s. She was the mother of 7 children, all of whom grew to adulthood. She died only 11 years after coming to the US, of a hernia, 20 January 1891. She was buried in Bayview – New York Bay Cemetery in Jersey City. View Ann's original post on Facebook. John Foulkes, my 3x-great-grandfather, was born in April 1840 in Stone, Staffordshire, England. His parents were migrants, too - both originally from Guilsfield, Montgomeryshire (now Powys), Wales. They moved often as his father was a timber carrier. He married Ann Hobson at St. John the Evangelist, Trent Vale, Stoke Upon Trent, 16 November 1861. He worked as a grocer, and also a plumber and glazier. By the time he immigrated, he was working as a china painter. He immigrated with his family to the US from Glasgow in the early 1870s. They settled in NYC for a brief period, but wound up in Jersey City by 1880. He continued decorating, dealing, and painting china in the USA - apparently amassing a small fortune. (Of course, none of it made it down to the descendants!) He apparently retired by 1891 - the business must have been quite profitable! He and his family bought what seems like half of Jersey City - there were dozens and dozens of deeds to be found in the Hudson County Recorder of Deeds office. After Ann died, he married Sarah (Wells) Hoesley in 1894. According to local newspapers, John had a Boston bulldog of "aristocratic pedigree" that caused some problems with his neighbors. He was also apparently a prominent yachtsman, and owned and rode thoroughbred horses, receiving numerous awards. He died 15 January 1915 in Jersey City. View John's original post on Facebook. Concetta Giordano was born 15 February 1868 in Agropoli, Italy. She is one of my thirteen immigrant 2x-great-grandparents. She married Aniello DiBiase there in 1890. She and her first two children arrived in the US in 1899, sailing on the S. S. Saale. Concetta ran a boarding house most of her early years in the US. According to family lore, at one time, she had thirteen boarders at once, all of whom were family and friends that paid around $3.00 a month or 10 cents a day. 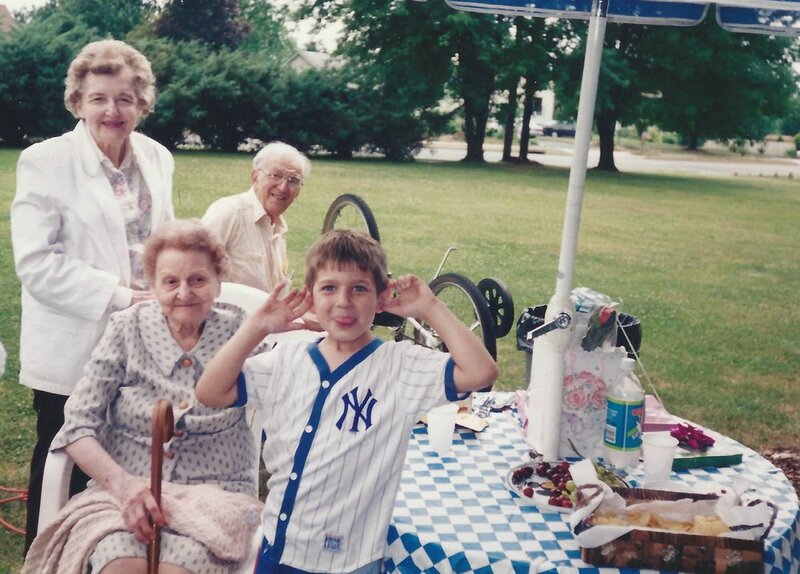 My grandfather remembered her as understanding and a lot of fun. He once told me, “We called her Mama dell', which means ‘Mother of Mine’ in Italian [more or less]. At her home in Pennsylvania, she had peach trees where you could peel off the skin of the peach just like a banana.” Concetta became a citizen when her husband did in 1915. They lived most of their lives in Wilmerding, PA. Aniello and Concetta had at least ten children, two of whom died in childhood. She died in 1963 in North Huntingdon, PA, at the ripe old age of 95! Hopefully, I inherited many of her genes! View Concetta's original post on Facebook. Aniello DiBiase was born 19 June 1868 in Agropoli, Italy. He is one of my thirteen immigrant 2x-great-grandparents. He married Concetta Giordano there in 1890, and they had two children in Italy. He worked as a farmer and farmhand in Italy, and immigrated to the US in 1894. He moved to Boston [in Elizabeth Township], PA, and worked as a laborer. (Early notes suggest in a brickyard - but where's the source!? :]) His wife and children joined him in 1899. The family moved Wilmerding in 1905. According to family legend, he lent Gennaro Camperlino (the father of his soon-to-be son-in-law) money to bring his family over in 1913. 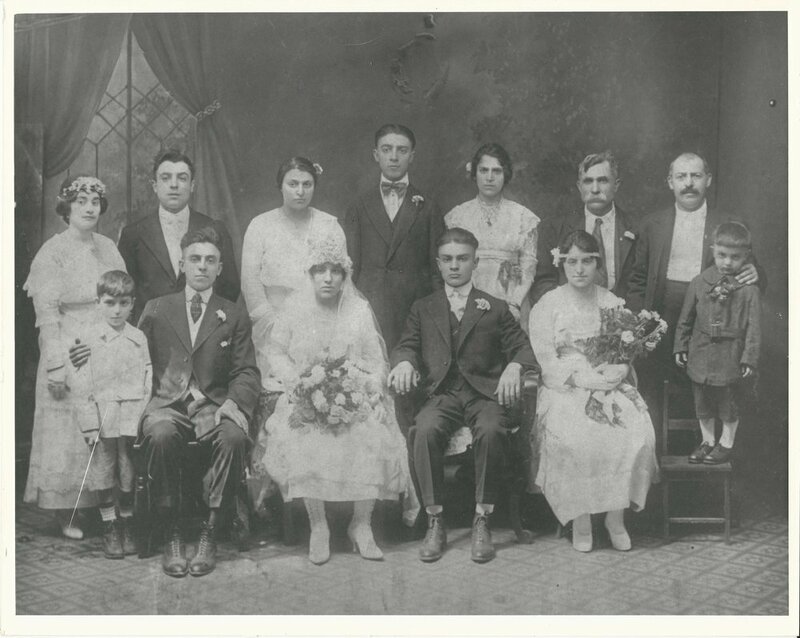 Aniello and Gennaro became as close as brothers... and were in-laws by 1919! Aniello and Concetta had at least ten children, two of whom died in childhood. Andy naturalized as a US citizen in 1915. Throughout his time in western PA, Andy worked as a day laborer, a machine hand, and a janitor. He suffered chronic asthma, and died in Wilmerding in 1935. Strangely enough, my first Italian immigrant ancestors that stepped foot on US soil lived in western PA... and now I find myself a proud Pittsburgh resident, just a few miles up the road from Wilmerding. What can I say? The call of my ancestors is a strong one. View Andy's original post on Facebook. Fortunata "Fannie" Piro was born 7 July 1900 in Capriglia, Pellezzano, Italy. She immigrated to the US when she was just 4 years old with her parents and older sister. She lost her father when she was 7, and grew up with her mother, stepfather, and step-siblings in Italian Harlem before moving to Jersey City. Fannie marched for women's suffrage - long before she became a US citizen. She married Raffaele Morelli in 1917. Their only child, Grace, was my grandmother. Fannie was widowed at 40, and worked full-time well into her 70s (at both S. Klein on the Square in Newark and Press in Jersey City). She naturalized as a US citizen amidst World War II, in 1943. She was one strong, opinionated, and independent lady, and I wish I remembered her better. She died when I was seven - the only one of my immigrant ancestors I was lucky enough to meet. I was told she often would take out her false teeth to frighten me... I can definitely believe this would have startled me! I remember her always with her cane, but in my young mind, it was less to hold her up and more to complete her ensemble as the quintessential great-grandma. As such, I chose a photo of her as how I remember her - taken about nine months before she died. Dad remembers that she had brandy every day - perhaps this contributed to her longevity! View Fannie's original post on Facebook. Ralph naturalized as a US citizen in 1923. He part-owned a farm in Hopewell, NJ, with his brother-in-law. The story goes that he and my great-grandmother had been picnicking on Doris Duke’s Estate, which they loved because of its natural beauty, and were chased away by the groundskeepers, leading them to want and buy a farm of their own. (True? Not sure!) Stories were always told about the well on the farm, and their dog, Mickey. Another story says the farm was only a mile from the Lindbergh house, and they were questioned after the Baby Lindbergh kidnapping. Ralph died on the farm (called Benjamin Farm) in 1940. Ralph is particularly special to me because it was through him that I was able to claim dual citizenship. I visited his birthplace for the first time in Summer 2017. View Ralph's original post on Facebook. Patrick Aloysius McGuire is my 2x-great-grandfather. He was born 28 May 1883 in Gaulsmills, Kilmacow, County Kilkenny, Ireland. He immigrated to America in 1891 with his mother and siblings. The family settled in Jersey City. He worked as a machinist in his early life. He married Christina Sobke in 1902, and they raised ten (!) children. He eventually became a carpenter and cabinetmaker with his own business. He is said to have been very low-key and a lover of baseball. He died in Jersey City in 1958. I have visited Kilmacow, and the church in which Patrick was baptized. Most of you know I spent over a year living in Ireland. Though I am only 1/16 Irish, I feel very connected to the Emerald Isle. I have Patrick to thank for that. View Patrick's original post on Facebook. Goliana "Julia" (Rizzo) Camperlino is my 2x-great-grandmother (one of thirteen foreign-born 2x-great-grandparents). Goliana was born 10 October 1874 in Agropoli, Italy. She was married to James Camperlino and they raised seven children. Goliana immigrated to the USA with most of her children in 1913, joining her husband and daughter in Wilmerding, PA. She never became a US citizen. View Goliana's original post on Facebook. Gennaro Camperlino is my 2x-great-grandfather. Gennaro was born 20 January 1871 in Agropoli, Italy. He worked as a farmer in Italy, and married Goliana Rizzo (also pictured) in 1893. They raised seven children (one of whom died in infanthood). Gennaro first immigrated to the USA in 1906, and he returned around 1909. He immigrated permanently in 1910, and resided in Wilmerding, Pennsylvania, until his death. He first worked as a watchman, and later as a repairman, for the Pennsylvania Railroad. At work, he was in an accident and had his left leg amputated. He became a proud US citizen in 1924, and died in 1947. His grandson, Albert, (my grandfather) remembered, “He used to give us kids cream soda with a little burgundy wine.” Now, that seems like my kind of guy! Gennaro, pictured here, far right of the back row. View Gennaro's original post on Facebook. Raffaela (Napoli) Piro D'Amato, another of my ancestors who was considered an "Enemy Alien" during WWII. She is one of my thirteen foreign-born 2x-great-grandparents. Raffaela was born 8 March 1864 in Baronissi, Italy. She worked as a weaver and married Giovanni Piro in 1882 in Italy. They had at least five children before immigrating to the USA in 1904. She and her family lived in Italian Harlem. She was widowed in 1907, with a young daughter (my great-grandmother) to raise. She remarried Michele D'Amato, a widow, in 1909, and they moved to Jersey City. She raised a number of his children. She buried one of her daughters in 1933, but was blessed with many grandchildren and great-grandchildren. Because she never became a US citizen, she was considered an "Enemy Alien" during World War II, and carried around identification papers with her. She died in 1947. She is pictured here with my grandmother. View Raffaela's original post on Facebook. Francesca Palumbo is one of my thirteen foreign-born 2x-great-grandparents. She was born 10 October 1870 in Rodi Garganico, Italy. She was orphaned as a child, and raised by nuns. She married Tommaso Carbone in 1891, but was widowed by the time she arrived in the US in 1910. She was held for Special Inquiry at Ellis Island upon arrival, likely because she was pregnant. She lived in Hoboken, NJ, and married again in 1912, to Salvatore Chetriello. He died in 1923, and she spent her remaining years living with her numerous daughters. (Lena was her daughter.) She was a pious woman - she attended St. Ann's Church every morning. Because she had never become a citizen of the US, she was considered an "Enemy Alien" during World War II, and carried around an identification card with her photo and information. (All German, Italian, and Japanese nationals residing in the US needed one of these.) Despite all of the hardship she endured in her life, she lived to be 96. View Francesca's original post on Facebook. Libera Maria "Lena" Carbone, was my great-grandmother. Born 7 March 1899 in Rodi Garganico, Italy, she came to America in 1912 with her sister. Her widowed mother had already arrived two years previous. Lena raised six children to adulthood, three of whom served in WWII. After she was widowed, she worked as a seamstress at the Waldorf-Astoria in NYC. She lived in Hoboken, and later Jersey City, NJ. She died 28 October 1970, and is buried with her husband in Jersey City. My dad remembers that she was very quiet and there was always something on the stove when he visited. As you can see from this photograph, she had the most beautiful smile. Lena married Raffaele "Ralph" Venezia in 1917. Click on his name to learn more about him! View Lena's original post on Facebook. Raffaele "Ralph" Venezia is one of my five immigrant great-grandparents. Born 14 February 1887 in Atripalda, Italy, he came to this country in 1904. He and many of his siblings worked for the National Biscuit Company (Nabisco) in New York City. In fact, when he died suddenly in 1935, he was apparently involved in a ten-week walkout, and had been one of the leaders of the strike. He and his wife raised eight children, two of whom died as children. Ralph was married to Libera Maria "Lena" (Carbone) Venezia, pictured here at their wedding in 1917. Learn more about Lena by clicking here. View Ralph's original post on my Facebook. Franz Werner Sobke (father-in-law of Patrick McGuire), my 3x-great-grandfather, was born in Prussia about 1855. He arrived in the USA at Castle Garden, NYC, on 28 April 1882 . He traveled on the S. S. Suevia with his sister, Ernestina. I believe they were from Weitenhagen, what is now Wytowno, Poland, but I am still working on confirming that! Franz "Frank" married Bertha Henriette Albertine Schroeder in Jersey City 22 August 1882. They had six children, and Frank worked as a laborer. He never became a US citizen, from what I have been able to determine. Three of Frank's brothers, and his mother, also came to live in Jersey City. Frank died 9 August 1896 in the middle of a massive heat wave in Jersey City that left dozens dead. He was buried in Flower Hill Cemetery in North Bergen, NJ. See Franz's original post on my Facebook. Document from New Jersey State Archives. James Francis McGuire was born 16 April 1859 in Upper Kilmacow, a townland in Kilmacow, County Kilkenny, Ireland. He was 1 of 31 3x-great-grandparents that was foreign-born. In Ireland, he worked as miller. He married Mary Ann Kenneally in 1883, and their first child, my 2x-great-grandfather, Patrick was born (very) shortly after. James immigrated to the UAS around 1891, and his wife and children soon joined him in Jersey City. At least one, if not two, of his siblings also immigrated, settling in Jersey City. James and Margaret had seven children - five in Ireland and two in New Jersey. James worked as a laborer on the railroad, and later became a carpenter for the Erie Railroad. He was widowed in 1898, but remarried in 1904, to Margaret (Drewes) Foley. He lived in Jersey City the entirety of his life in America. He never naturalized as an American citizen, as far as I can determine. At the time of his death, he had 20 grandchildren and 24-great-grandchildren. He died in 1952 at the age of 93. Quite a legacy! Are you ready to meet your immigrants? Let's work together to find your roots. View James's original post on Facebook.